Great progress is being made. The new wall in the center is poured. Eventually wewalk down on the right (after the sand is removed) toward the new elevator from the Great Hall. The area to the left of the wall will be filled in with sand, compacted and a concrete slap poured. (Slab pour is scheduled for July 2nd.) Eventually, a nice railing will go on top of the wall to prevent folks from falling to the new walkway below. This is the view from the Great Hall. Note the five steps are now removed. 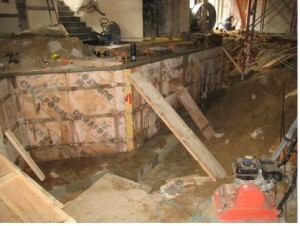 New steps to the bathroom level will be built at an angle from the new wall on the left. In this photo, the kitchen is to the right. We will walk down this new hallway on the right side to the elevator. The foundation wall was removed. 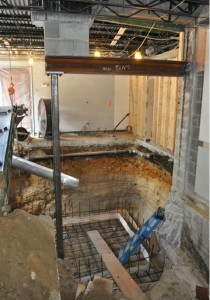 A steel column is in place along with a steel beam to keep the floor above from falling. The LPC kitchenette wall needed to be removed to make the elevator shaft, so a temporary plywood wall is in place on the right. The meeting room door is on the back left. You can see why it is important to not use that door at this time. The elevator pit foundation is being readied for the concrete pour. 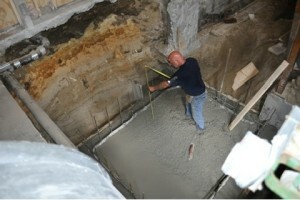 The concrete is spread evenly around the elevator pit foundation. 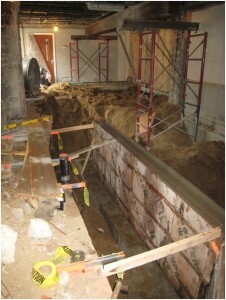 On Monday, four foundation walls will be poured rising up to the level of the Great Hall’s floor. 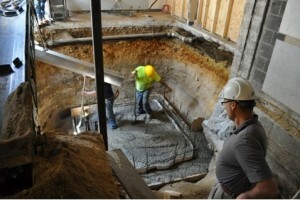 Bowdoin’s Project Superintendent, George Taran, is observing the pour. Eventually a cement block elevator shaft will rise up to the 2nd floor (stopping at the attic). 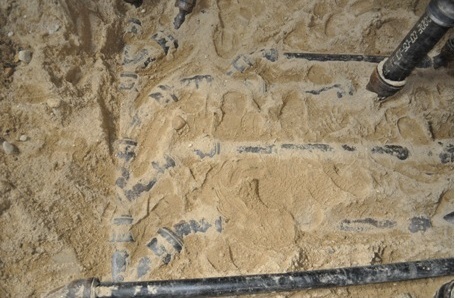 The bathroom floors have all new pipes. On Thursday the concrete truck will return to pour the slab floors in the bathroom and all of the new hallways! 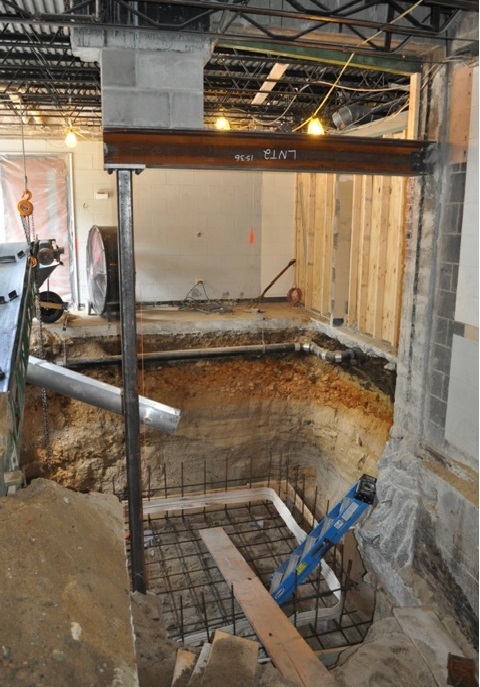 Once the new floors are poured, the new walls will be constructed for the bathrooms, hallways and the bottom of the side entry stairway.